Doldrums come from historical maritime language that refers to parts of the Atlantic and Pacific Oceans where the prevailing winds are calm. This calmness or lack of winds is often seen as a depression, listlessness, or stagnation. But I am left wondering if that is a Western bias favouring action, goal setting, decisiveness, and fear of “sitting with” uncertainty and not knowing. Even as I was hoping this trip would provide a “turning point” for my 65th birthday, a direction for the last years of my academic career, and a sketch of retirement opportunities, the route sailed into the doldrums. There were no neat beginnings and endings, and life slipped in and out of the trip with no clear narrative. Uhmmm!! “I do not know,” responded Fayan. “Not knowing is most intimate,” observed Dizang. As a professor and scholar, I am “supposed” to know things, but what is it to deeply and profoundly admit that I do not know? And what is this great intimacy of not having to know? To simply wander and touch the texture of life without knowing or imposing a goal, model or theory—to be open, attentive and curious about what appears? Even as a bicycle trip follows roads and highways, the freedom of a self-supported trip without fixed destinations and deadlines parallels sailing or kayaking. I was always drifting off course—a little to the starboard, shifting to port, always correcting, adjusting, refining. Stops were longer to adjust for Zander, the weather, or my health. And, as in life, there was no “true” endpoint—life, goals, and bicycle trips are always adapting and adjusting. So, the final weeks in Nova Scotia included resting and dealing with the rebellion of my gastrointestinal track, renting a Jeep Cherokee to get the bicycle, trailer, gear, Zander and I to Halifax, and a changed to come home earlier. Self-supported bicycle trips, for me, are magical because they combine the meditative pace of a repetitive movement that allows me to be attentive moment-by-moment, opportunities to step out of my comfort zone, preconceptions challenged, and different ecological, cultural and social systems to explore. And this trip I had Zander along to learn about his personality, quirks, and preferences while working with him to wait patiently and sleep properly in a sleeping bag (not likely!). Focus on the joy of each moment. The journey was lighter and more enjoyable when I was focused pedalling one stroke at a time, enjoying the aromas of the world (Zander taught me this one—especially since he rolls in them and I get to revisit them at night when he wants to cuddle! ), focusing on what was around me right in the moment rather than the end of the day. Hills/Problems look bigger from a distance. And even when they are big or steep, they are travelled one pedal stroke at a time, in a lower gear, or by walking Zander (which he and I loved). Minimal space and things makes a journey joyful. It is always difficult to gauge the gear necessary for a trip, especially when responsible for another living being. Several times, I had to re-evaluate and ask the right question: Can we survive without this piece of equipment? The lighter the load, the easier the movement, the less tired we were, and the more joyous the travel. You can’t control anything. When things go wrong or not as expected or new opportunities arise, as they inevitably do, responses such as frustration, anger, depression, or rushing in to “fix it” are usually unhelpful at best. The theme for the trip was patience or “wait and see”—a marvellous strategy because in most cases I was not in control of anything. More valuable strategies were grabbing a drink or snack, walking Zander, relaxing a few minutes, or sleeping on it. This stepping backwards provided a larger horizon to evaluate whether we needed to change or stay the course, allowed multiple solutions to emerge, and a comfort that everything has a way of working itself out. What was once considered a loss in the end simply felt like a change or a transition. In the final analysis, kilometres don’t really matter. The original route was very ambitious and included many more kilometres. However, there is no right path or route, only the one we choose. The journey was filled with many grand adventures, great people, and wonderful experiences. I have dreamed of doing a bicycle trip with Zander for some years, and it came true. Our pace was the right pace. Laughter makes everything better. No amount of complaining or critique changes things. Laughter lightens the atmosphere and makes the riding easier. This was especially true around Zander. When I got angry or frustrated at anything, Zander felt it as directed toward him—ears back and body closer to the ground. He was a great teacher for me to change my attitude!! And sure enough, the events were funny and it was just another event in our day. The joy of bicycle touring is in the riding—the sites, the tourist destinations are less important than the journey and the riding. The journey is in the moments—they are what counts, where joy lies. Cyclist-in-motion allows the land to shape the cyclist’s body and soul. Although I was delighted to see Cape Breton by car, I missed the visceral connection with the land itself. That’s where the learning and heart lies. Always be suspicious of someone in a motorized vehicle who tells you the destination is not far. There is a radical difference in how cyclists and people who drive motorized vehicles perceive space, time, and distance. At least in Nova Scotia, few people could actually provide accurate estimates of objective measures of distance or time. So, typically, no matter what there estimates were, we were usually in for several more hours of cycling. I am still puzzling over the “secret destination” of this trip. I found no answers, no certainty around how to plan the last years of my time at the university or what retirement might hold within this trip. On the other hand, I found a comfort in drifting and simply following the road where it led me—and an ease in living more simply with less. So, I am home waiting for my bicycle to catch up with us. Fortunately, I have a little folding bicycle in the meantime to keep me commuting. The one thing about bicycle touring is that it makes driving a car seem strange and “a hassle.” I appreciate the comfort and ease of settling into bicycling in the city. I have a sense that I have been reshaped by loss, chronic health conditions, and life’s transitions, placed at crucial junctions between uncertainty and endurance—which may be a pragmatist’s version of hope. And hope, for me, is not an emotion or feeling but a movement—like pedalling one stroke after another up a long hill—and the simple movement eventually brings me to the top of the hill, to the next campsite, to the next idea, to the next day, to a type of resolution that allows the next adventure to come into existence. And, like bicycling, once I gain some momentum it begins to carry me further than I had expected. Watching for people, dogs, and SQUIRRELS. ANOTHER WALK!!! YEAH!!! Roll in more fishy stuff! I smell real good now!! Dinner time! Tip over food bowl just in case the squirrel likes kibble! Bed time. Owner checks all my black fly bites and another massage. I get to the sleeping bag first for prime position. Owner has to wiggle around for whatever is left over!!! 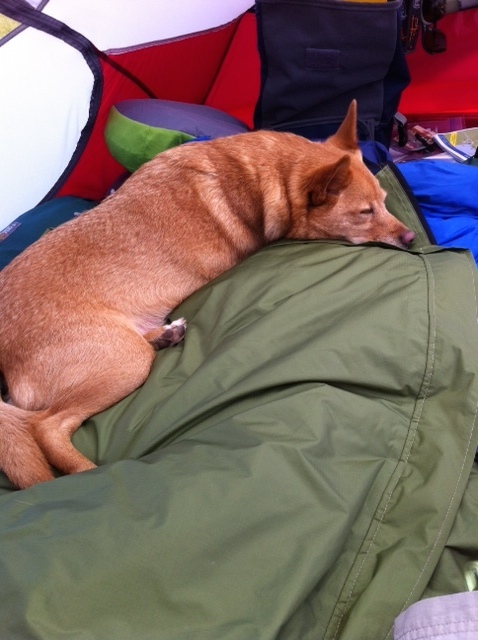 Karen: I am busy trying to to go with the flow–and finding some room in the sleeping bag! Zander enjoys meeting people, settling into one place. 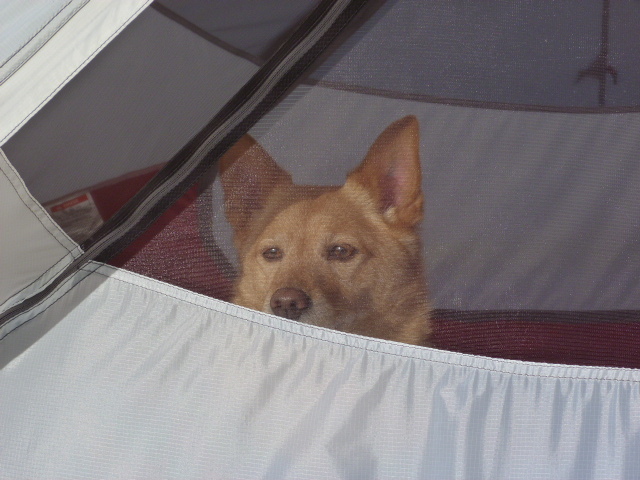 He is now comfortable staying in the tent as I wash dishes, take a shower, etc. He is getting more at ease waiting whileI shop, but he still sits “at attention” eyes focused until I return. Long cycling days are a strain, but long downhill rides are fun for him! The trip is shaping up very differently than planned with unexpected gifts and surprises. More to come from Zander and me!